Working as a loader at Mandi Mohalla market in Mysuru, Karnataka, the 38-year-old has six phones and is on call 24x7. MYSURU: Visiting mortuaries may not be the ideal way of spending weekends for most working professionals. But Ayub Ahmed is not an ordinary worker. Working as a loader at Mandi Mohalla market in Mysuru, Karnataka, the 38-year-old has six phones and is on call 24x7. Not unusual for a man who has made giving a dignified last farewell to unclaimed bodies the mission of his life. He goes around in his old Ambassador car whenever he gets a call from hospitals, police or public. 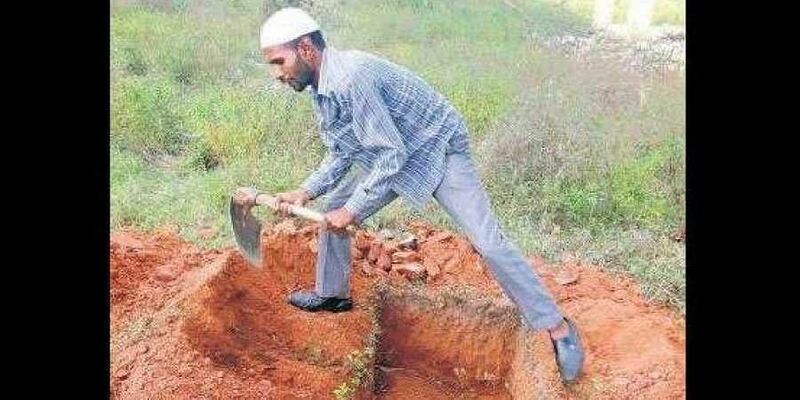 Once the paperwork is done, he takes unclaimed bodies to the graveyard and conducts the last rites — as per the faith, if possible. Though he has not kept count, Ahmed says he must have buried about 10,000 bodies in the past two decades. He usually spends his own money for the burials though sometimes he gets donations. He also posts photos of the bodies on his Facebook page in the hope of reaching out to the relatives of the deceased. How did he choose this ‘vocation’? It was an incident that changed his life. Two decades back, he was travelling to Gundlupet in a KSRTC bus to buy a used Ambassador car. On the way, he saw a few people around a dead body near Bandipalya on Mysuru-Nanjangud road. When he was returning to Mysuru in his car, he noticed the body was still there. “When I asked a policeman, he said there was no one to help shift the body. I said main hoon na (I am there) and transported the body to the mortuary in my car,” Ahmed recalls. After the incident, he had to face huge opposition from parents and friends. “I had to shift from Mysuru to Bengaluru. In Bengaluru too, I once helped shift an unclaimed body found near Lalbagh. That’s when I decided to take up this service. I returned to Mysuru and spoke to my parents who then relented,” says Ahmed. Born in a poor family, Ahmed always had a soft corner for the needy. “During my school days, I used to bunk classes and beg on the streets to buy food for the destitute. But one day, my uncle saw me and informed my parents. My father then warned me to stay away from begging,” he informs. Though Ahmed did not continue his education, he kept reading verses from the Quran, which he says helped him be a strong believer of mankind. He lives in a small rented house in Shanthinagar, and has two daughters. “My wife Roohi Tabassum supports my mission. Even if I get a call at midnight, she gives me a jacket to wear and asks me to take care,” he said.